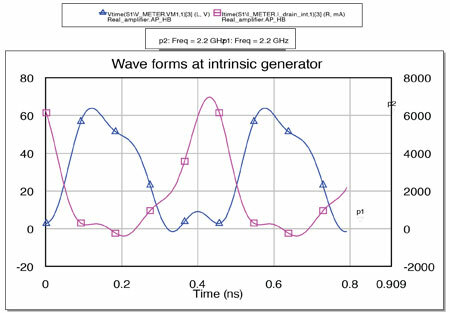 The purpose of this note is to demonstrate a simulation-based methodology for broadband power amplifier design using load-line, load-pull, and real-frequency synthesis techniques. The design shown in this application note is a Class F amplifier and was created using the Qorvo 30W GaN HEMT T2G6003028-FL transistor. Goals for this design were: a minimum output power of 25W, bandwidth of 1.8 - 2.2GHz, and maximum power added efficiency (PAE). The design procedure was performed using the Modelithics GaN HEMT non-linear model for the Qorvo transistor mentioned above; Modelithics Microwave Global Models for the passive components in the matching network design; and the Amplifier Design Wizard (ADW) from AMPSA (all tools available within suitably configured NI AWR’s Microwave Office). 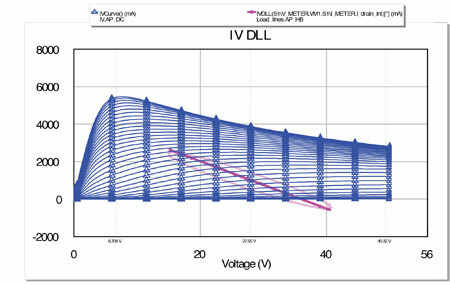 For this design methodology it is crucial to have access to the intrinsic device channel voltage and current. 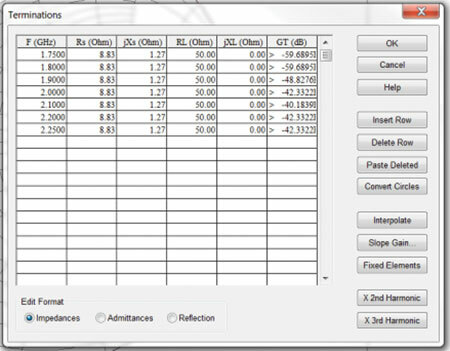 Such capabilities are available in the advanced non-linear Modelithics GaN models. The design begins with measurements of the voltage and current at the drain-source intrinsic current generator within Microwave Office. The near optimum load-line, impedances of the fundamental frequency, and harmonic impedances for a single frequency are located for the required mode of operation. The impedance regions are then extracted using load-pull simulations. 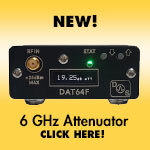 Using ADW, the “real-frequency” synthesis of the matching networks can be quickly realized simultaneously for the fundamental and harmonic impedances across a wide bandwidth. These fully laid-out matching networks can then be exported to MWO for the remainder of the design optimization, non-linear analysis, and electromagnetic (EM) simulation. 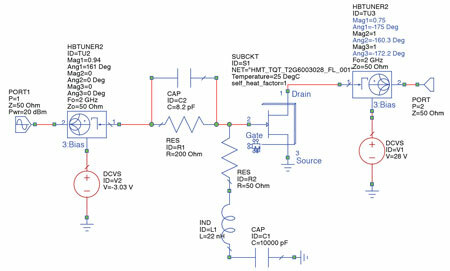 To begin the design process, a schematic to bias and stabilize the transistor must first be drawn. Once the conditions required for stability and biasing are established, the initial load-line analysis and harmonic impedance tuning can be performed (Figure 1). Figure 1 • Top – Schematic to bias and stabilize transistor. Bottom – IV curve simulation schematic. First, a line is drawn on top of the IV curves to approximate the near optimum load-line for the fundamental frequency (the maximum swing of the RF voltage and current before hard clipping occurs). 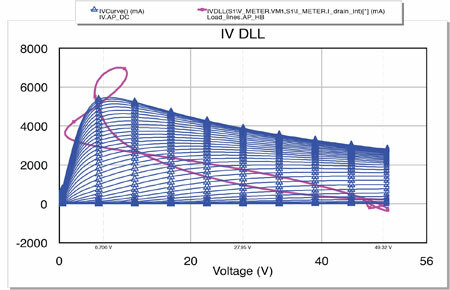 Then the dynamic load-line, defined using meters located within the model to monitor the intrinsic drain voltage and current and superimposed on the IV curves by the IVDLL measurement, is tuned to be a straight line and parallel to the drawn line. The tuning at a chosen frequency is performed by tuning the magnitude and phase of the output tuner impedances. At this stage, the harmonic balance simulation is limited to just a single harmonic—the fundamental frequency. Additionally, the harmonic impedances of the output tuner and all the impedances of the input tuner are set to 50Ω. The final results of the tuning can be seen in Figure 2. Figure 2 • IV curves with dynamic load-line superimposed. Once the impedance of the fundamental frequency is known, the second and the third harmonic impedances presented to the intrinsic drain can be tuned according to the desired mode of operation. In the case of this application note, Class-F operation is desired, meaning that the second harmonic impedance is tuned to a short circuit and the third harmonic impedance is tuned to an open circuit (Figure 3). Figure 3 • Smith chart view of the fundamental and harmonic impedances of the output tuner. The fundamental impedance of the input tuner is then made to be a conjugate match to the S11 of the transistor and stability / bias network. This will provide the best match and therefore, maximum gain. The harmonic impedances of the input tuner are set to 50Ω. 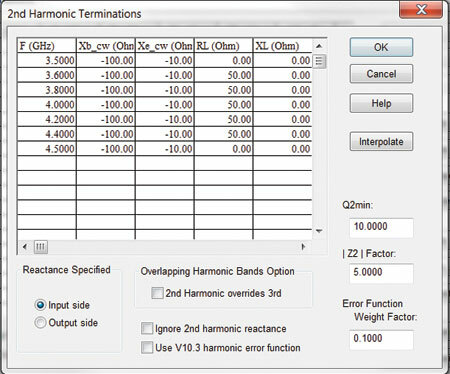 Now that all of the impedances have been tuned, a final harmonic balance simulation (using three harmonics) is performed to confirm the design is in the desired mode of operation. Figure 4 and Figure 5 show the classic shapes of a Class-F mode design. Figure 4 • Final dynamic load-line after harmonic impedance tuning. 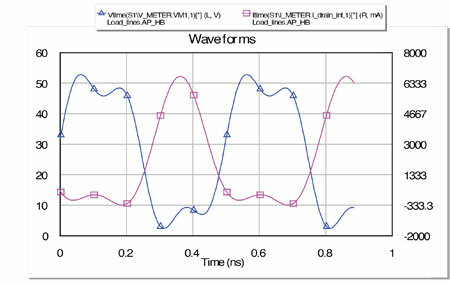 Figure 5 • Intrinsic voltage and current waveforms after harmonic impedance tuning. 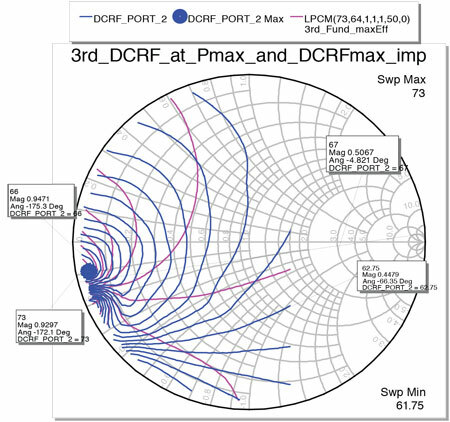 With the previously defined input and output impedances, load-pull simulations are performed to produce contours first for maximum power (Pmax) and then for maximum drain efficiency (DCRF). The same schematic is used for the load-pull simulations as for the initial tuning except for the addition of an XDB control element (Figure 6). This provides contours which are not only at a constant power, efficiency, etc., but also at a constant gain compression. Figure 6. 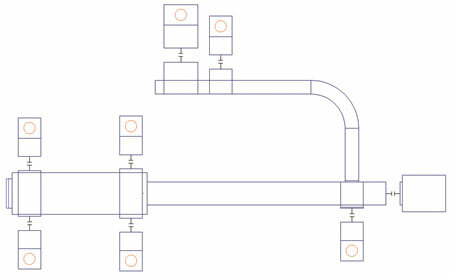 Load-pull simulation schematic. 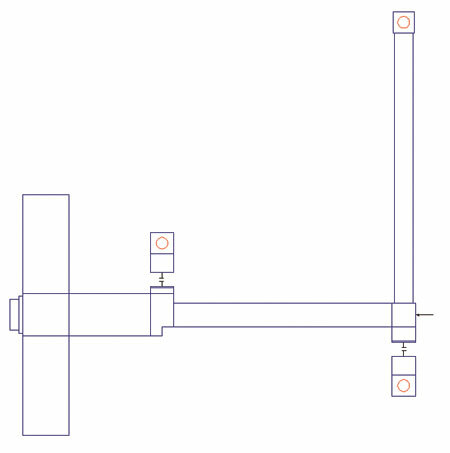 Notice that the schematic is identical to that of Figure 1, however the input and output impedances have been updated and the XDB component has been added. In Figure 7, the contours at the fundamental frequency for both maximum power and efficiency have been superimposed in order to define a region of compromise for mutually acceptable power and efficiency. In this case, an output power 1dB below the maximum and an efficiency 5% below the maximum has been chosen. 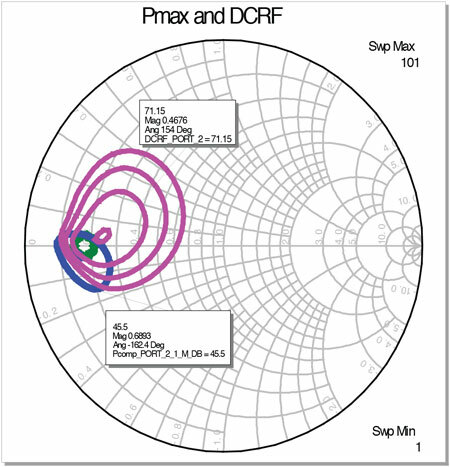 In the plot shown, a circle defining this region is placed by using an equation to define the acceptable area of the fundamental frequency impedance for the synthesis of the relatively broadband output network. Figure 7 • The load-pull contours of the fundamental frequency for maximum power (blue) and drain efficiency (magenta) have been plotted in the same Smith chart. The green circle defines the region of mutually acceptable power and efficiency. Next, load-pull simulations for second and third harmonic frequencies are performed at the two impedances that provided the maximum power and maximum efficiency in the load-pull simulation of the fundamental frequency. The results for both load-pull simulations at the second and third harmonic can be seen in Figure 8. For the simulation at the second harmonic frequency, the optimum maximum efficiency in both cases is the same and the contours are essentially the same. A line is drawn to bound the area with acceptable performance. In this case, the acceptable region is below the line. For the simulation at the third harmonic frequency, the optimum maximum efficiency is again the same in both cases. However, the contours differ somewhat. Fortunately, the effect of varying the third harmonic impedance is small and an acceptable region is easily defined above the drawn line. Figure 8 • Top – Plot of load-pull contours for the second harmonic frequency at the fundamental impedances for maximum power and drain efficiency. The acceptable region is below the drawn line. Bottom – Plot of load-pull contours for the third harmonic frequency at the fundamental impedances for maximum power and drain efficiency. The acceptable region is above the drawn line. 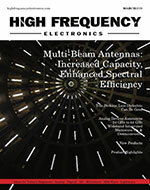 The described impedance extraction process is performed for a few frequencies across the desired bandwidth. 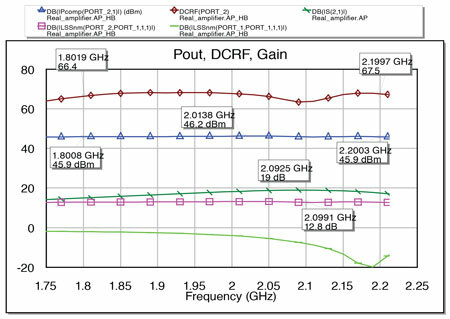 In the case of this application note, simulations for 1.8GHz, 2GHz, and 2.2GHz were sufficient. 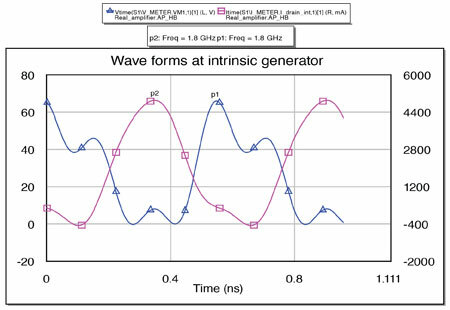 It is important to note that this is a streamlined method of extracting the fundamental and harmonic impedances relies on access to the voltage and current across the intrinsic generator. Access to the intrinsic device nodes allows for a near optimum tuning of the fundamental load-line (impedance) and fixing the harmonics impedances for a particular mode of operation at the outset of the design flow. If the transistor model was a black box or the intrinsic access was not used, the load-pull impedance extractions would need to be performed for far more iterations. First, load-pull for the fundamental frequency has to be done with the harmonics set to 50Ω. Then, the load-pull has to be performed for harmonic loads and then with the newly found harmonic impedances. For the highest performance, load-pull for the fundamental is again repeated. More iteration is needed for the harmonics, and at that point one might want to stop the iterations. The issue with this approach, other than the number of iterations required, is the uncertainty that optimum loads were actually defined, and nothing will be known of mode of operation. Once all impedances have been determined, ADW will be used to synthesize the broadband matching networks. 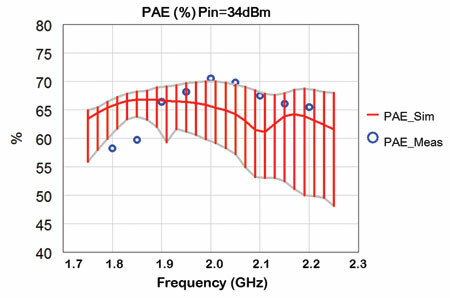 The required fundamental and harmonics impedance areas across the desired bandwidth are defined in the corresponding facilities of ADW are shown in Figure 9. 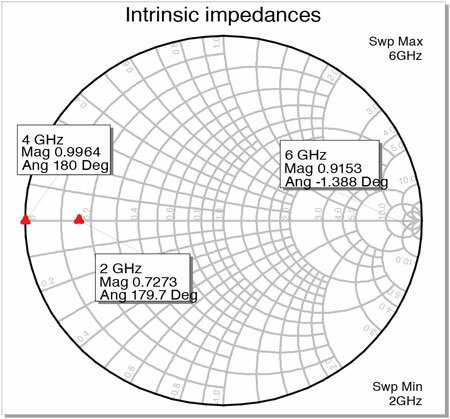 The fundamental impedance areas for each frequency are circles on the Smith chart. 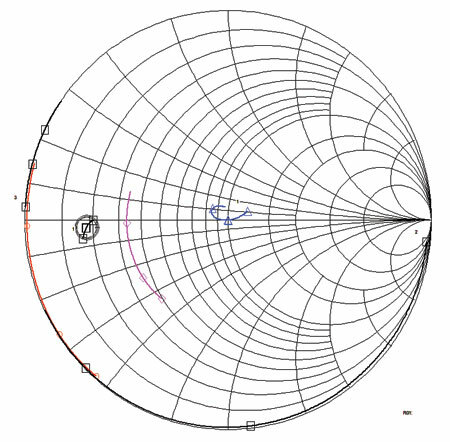 The harmonic impedance areas are sections of the Smith chart. Figure 9 • Top - Examples of the termination definition facilities in ADW. Bottom – Smith chart view of desired termination impedances (red, grey, pink, and blue) versus achieved impedances (green). Based on the impedances input into ADW, an initial hybrid microstrip/lumped component output matching network was synthesized (left image in Figure 10). The initial design is then exported into ADW’s analysis facility for the addition of all decoupling components, optimization and layout manipulation. 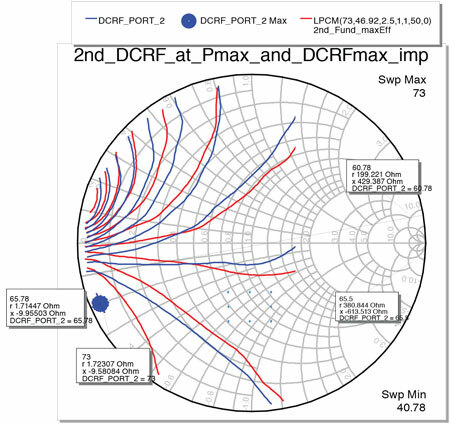 The final output matching network design can be seen on the right in Figure 10. The same process is performed for the input matching network and both designs are exported to MWO to finalize the design. 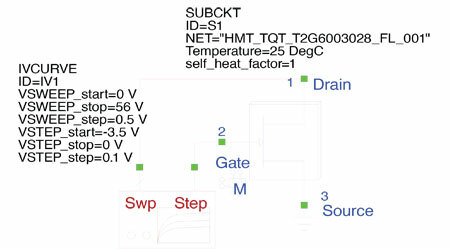 Figure 10 • Top– Initial hybrid microstrip / lumped element output matching network created in ADW. Bottom– Final output matching network after decoupling elements, optimization and layout manipulation is complete. Once the matching networks are in MWO, Modelithics models are substituted for the surface mount lumped element models used in ADW. Final linear, harmonic balance, EM, and DC simulations are then performed to fine-tune the design. The described design process typically eliminates the need for optimization. The final layout and design performance can be seen in Figure 11 and Figure 12, respectively. Figure 13 shows the simulated intrinsic device channel voltage and current waveforms at 1.8GHz, 2GHz and 2.2GHz. It can be seen that the mode of operation of the final design is very close to Class-F across the required bandwidth. It could be claimed that the described method of design achieves an extended continuous Class-F mode of operation . 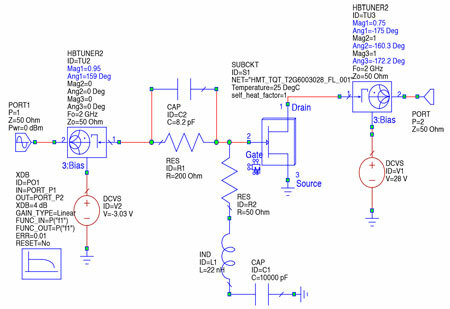 Figure 11 • Final layout for the Class-F amplifier design. Figure 12 • Final simulated performance for the Class-F amplifier design. Figure 13 • Simulated intrinsic device channel voltage and current wave forms at 1.8GHz (top ), 2GHz (middle), and 2.2GHz (bottom). The Class-F power amplifier design presented in the design flow above was built and tested. An image of the assembled amplifier can be seen in Figure 14. The measured results presented in Figure 15 - Figure 18 are presented without any tuning. As evidenced by the following figures, excellent measurement to simulation agreement was achieved without any on-the-bench tuning. Figure 14 • Assembled Class-F amplifier design. 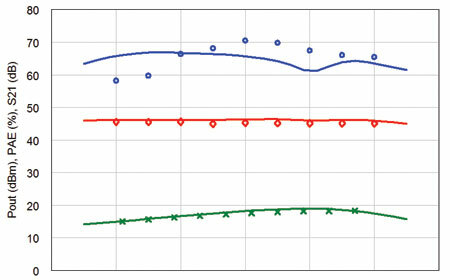 Figure 15 • Simulated versus measured output power (red), PAE (blue), and S21 (green). Lines show simulated performance, symbols show measured data. Figure 16 • Simulated versus measured small signal S-Parameters. Figure 17. Simulated versus measured output power (left) and PAE (right). Figure 18. Results of a preliminary yield analysis showing the effect of part value tolerances on PAE. Performed with 5% tolerance on all capacitors in the output matching network. Although there is a small difference in simulated versus measured output power, this is to be expected as in reality there would be slightly more losses in each element, the transistor would heat up, and the models of the transistor and any other component could not be perfect. However, the difference in PAE is somewhat more substantial. In an attempt to resolve this discrepancy, a preliminary yield analysis was performed on capacitor part values in the output matching network (Figure 18). All capacitors were assigned a 5% tolerance. It is perceived from the yield analysis that some initial tuning could reduce, if not eliminate the discrepancy in PAE. 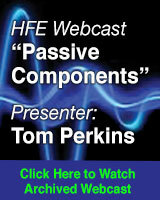 A streamlined practical design method for a broadband high-efficiency RF power amplifier was presented. Using Modelithics transistor models with access to the reference planes at the intrinsic generator allows for a new approach and shortened process of extracting the fundamental and harmonic impedances to obtain the desired performance. 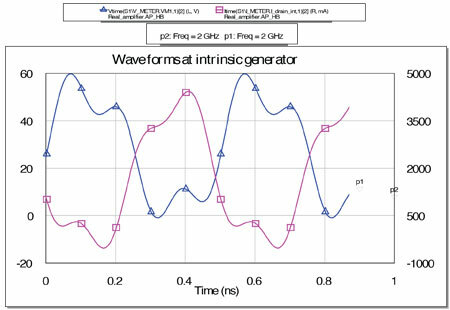 The new approach is to pre-tune the fundamental and harmonics impedances presented to the intrinsic current generator before performing load-pull simulations. The efficiency and creativity of the design process is also substantially improved by using the Amplifier Design Wizard which is the only commercially available “real-frequency” and “real-world” matching network synthesis tool. It also provides many levels of automation to drastically reduce the amount of time required to create and manipulate the schematics and layouts. Vincenzo Carrubba, Alan. L. Clarke, Muhammad Akmal, Jonathan Lees, Johannes Benedikt, Paul J. Tasker and Steve C. Cripps, “On the Extension of the Continuous Class-F Mode Power Amplifier”, IEEE Trans. Microw. Theory Tech., vol. 59, no. 5, pp. 1294-1303, May 2011. Ivan Boshnakov is with ETL Systems Ltd. Malcolm Edwards works at NI AWR. Larry Dunleavy and Isabella Delgado are with Modelithics Inc. Thanks to Adam Furman and Scott Skidmore of Modelithics for assistance with assembly and testing of the power amplifier example used in this note. For information on accessing the Modelithics-Qorvo GaN Model Library or the Modelithics COMPLETE Library please contact Modelithics at sales@modelithics.com or via the web at modelithics.com.